I got a stack of autographs out at camp that year, and future Hall of Famer Mike Munchak was one of them along with Bruce Matthews. Together they formed one of the greatest 1 2 combinations in the NFL on the offensive line, and these two were basically inseparable it seemed, on or off the field once Bruce was drafted in 1983. Munchak was a heavily decorated lineman coming out of Penn State in 1982 and had all of the skills, metrics, and size that you could want out of a prototypical guard (6’3, 281). 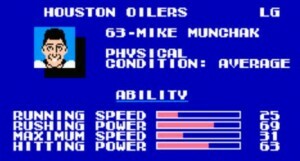 The 8th pick taken in the first round by the Houston Oilers, he’d play his entire career in Houston and by 1984 had established himself as a formidable force. In a day when defenses could do a lot more to limit production of the passing offenses, the Oilers typically ranked near the top of the passing charts and near the bottom in sacks allowed with Munchie nailing down the left guard position. Equally adept at the pass or run, Munchak was named to 9 Pro Bowls and first or second team AP 10 times over his distinguished career. He’d see the rebirth of the franchise from the doormat of the AFC Central (2-14, 1983) to the dominant power of the AFC (12-4, 1993) as injuries to his knees eventually forced his hand into retirement after the 1993 season. 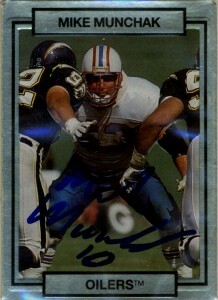 Named to the 80s All NFL Team, Munchak had his number retired by the Tennesee Titans (who he never played for). He has worked his way up the staff of the Titans and after Jeff Fisher’s departure from the franchise in 2011, Munchak was a shoe in for the job. Ironically in 2010, the Texans attempted to steal Munchak off the staff of the Titans to pair him up with Matthews as coaches again in Houston, -but the Titans refused to grant an interview. The Titans then turned around and hired Bruce Matthews off of the Texans’ staff to be offensive line coach reuniting the inseparable linemen again but this time in Tennessee.